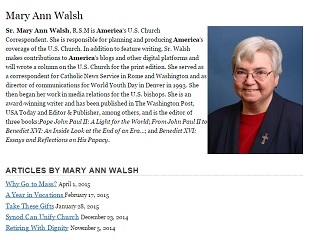 Sister Mary Ann Walsh was 68. In November 2012, Sister Mary Ann Walsh introduced as part of her U.S. Conference of Catholic Bishops media relations duties a blog post format that amounted to a tip sheet of five relevant news items and tidbits. 1. Mary Ann Walsh was born and raised in Albany, New York. She joined the Sisters of Mercy at the age of 17 and celebrated her jubilee year last October. The word “mercy” brought an easy smile to her face. She believed in her mission. Phil Pullella, senior correspondent in Italy and the Vatican for Reuters, told of his friendship with Sister Mary Ann that began when she was a reporter in Rome for Catholic News Service. In March, Walsh received the St. Francis de Sales Award, which honors lifetime achievements, from the Catholic Press Association. The America magazine obituary is here. RIP.